Jodo is the way of Jo or the short wooden stick. The most widespread form of Jodo practicing nowadays is Zen Nihon Kendo Renmey, also known as Seitei Jodo. Shimitsu Takaji Sensei developed it in the late 60's based on the old school (koru) - Shinto Muso Ryu. Muso Gonnosuke (Katsuioshi), a disciple of the old schools - Tenshin Shoden Katori Shinto Ryu and Jikishinkage Ryu, established this traditional jutsu school at the end of the 16th century. In the school, all students were familiarized with various kinds of weapons: Kodachi, Nito, Tanjo, Jute, Tessen, Kusarigami, besides the traditional Jo and Ken that were included. Few trustworthy details describing the founder's personality are preserved. They are mainly referring to the invention of Jo and his notorious duel of honor with Miamoto Musashi. The legend has it that Muso's inmost concept of martial arts was set in the notion of suigetsu (water-moon). This is a principle of merging one's energy with the adversary's one - exactly as the moon's reflection follows water's wave motion. The same could be found in Ueshiba's words: "Embrace your opponent with your spirit and you will possess the power to lead him astray in any direction you want to; leaving yourself bare you compel him to abandon his defensive tactics and to commence an attack. When you have accepted 99% of the attack and have crossed the frontier between life and death - only then you could clearly feel the direction of your action. And that is the way people ought to practice. After this manner our ancestors could acquire vision over the war strategy, even though improving their skills on a tatami. This is actually the principle of suigetsu." According to other sources, Gonnosuke discovered that while the sword causes severe injuries, the wooden stick does not, which allows finding different approach to techniques. To develop this idea, he took a vow in the temple of Homanga, practice center of the Tendai sect, where he reached to enlightenment about the true nature of the wooden stick. 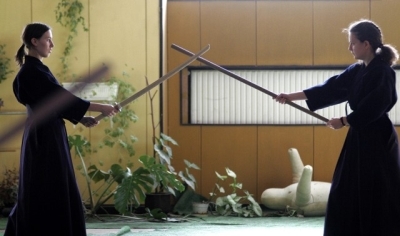 Unlike most traditional Japanese weapons many of which were designed to kill, the short stick can be used to knock down an opponent without inflicting any major injuries or causing death. Most common techniques with jo are directed towards the face, wrists and midriff (suigetsu). It is said that in the process of developing Shinto Muso Ryu Jojutsu, Muso combined the art of sword wielding with the arts of spear (iari) and halberd (naginata). The wooden stick is 2.42 cm in diameter (8 bu) and 127.6 cm in length (4 shaku, 2 sun, 1 bu). It could be put to utilization by striking with both of its endings, the distance may vary as the jo slides in between the palms or position of hands changes. After the development of his art and its vast dissemination throughout Japan, Muso Gonnosuke became school master of the Kuroda clan (kin), and Jodo turned into one of the top secret martial arts by that time. School masters weren't given a permission to teach jojutsu outside the han (the feudal territory) until 1872 when the Meiji reform was implemented. In the 20th century, Shimitsu Takeji renames the style to Jodo and developes twelve fundamental exercises as part of the training system. Seitei Jodo is now being directed by the Japanese Kendo Federation on the basis of this modernized form of Shinto Muso Ryu Jodo.